Which miniatures for Italian Wars armies ? I want to paint the armies for the italian wars (Italians, French and Spanish) but as Venexia italian range is still unavailable I don't know wich miniatures are the best, can You help me please ? 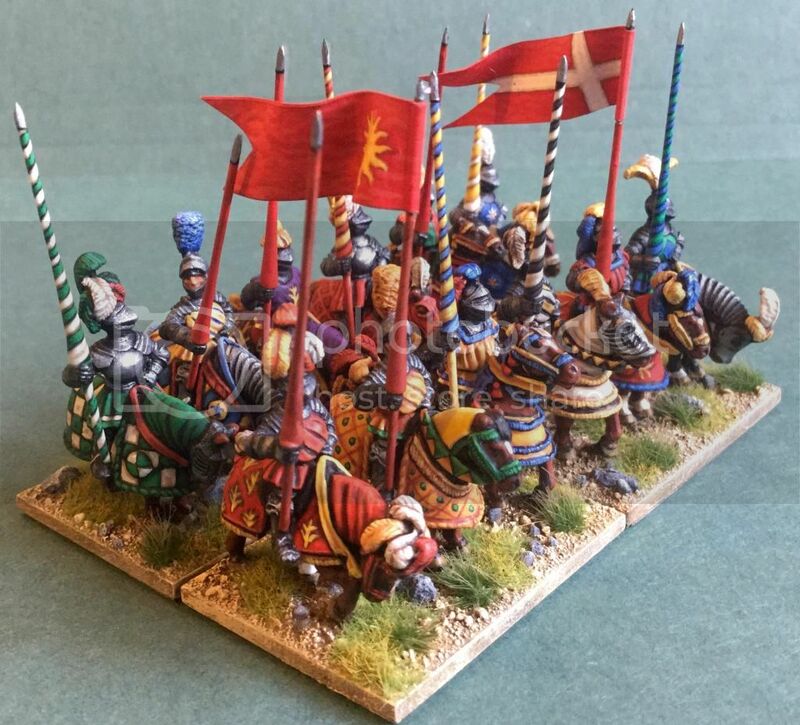 Re: Which miniatures for Italian Wars armies ? The first thing is which period of the Italian Wars you want to. If it is the very early period then late 15th C figures like Mirliton would be a possible solution. 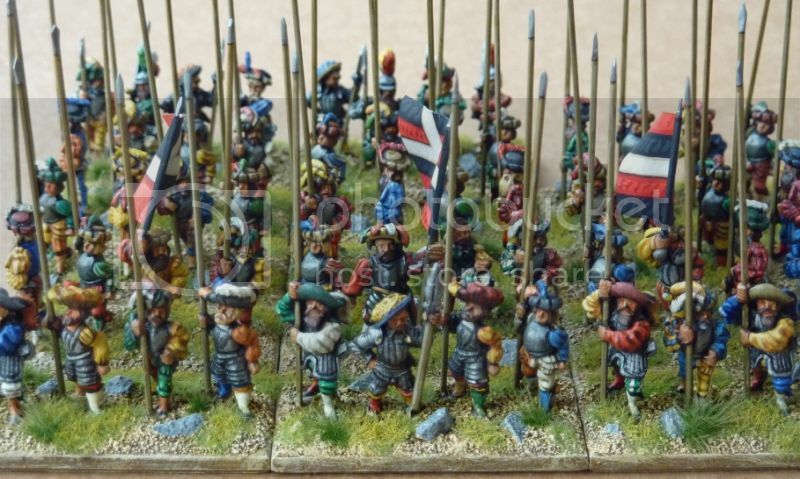 For the 1520s (my own choice for my French Army), for the best results, I think you need a mix and match approach and to be willing to do some minor conversions. In particular, I think the key to mixing different manufacturers successfully is to replace spears, pikes and lances with wire (and maybe heavy weapons). I am using a mix of old and current Minifigs, Frei Korps, Asgard/Table Top Games/Altuos, Essex and now Khurasan. I have a unit of Essex Gendarmes. These are nicely moulded with a variety of styles and poses but lots of the horses have a rather head-down depressed pose and a lot of them are not really right for French or Italian. I also had to add or extend their skirts. The way they hold their lances looks a bit odd and the lower part of the lances, below the hand is too long. I replaced all these with wire and Milliput. My other Gendarmes and command units are a mix of old and new Minifigs and Altuos. Again, I replaced the lances and made some simple modifications to skirts and horse barding. The Landsknechts are another mix: old and new Minifigs, Altuos, Frei Korps and one Black Hat (middle standard bearer). My Aventurier Arquebusiers are Old Glory with a converted Essex sword and buckler man as an officer. As standard they looked too much like Landsknechts for me and I have modelled new hats and helmets for some of them to give a more mixed look. I will be doing some Swiss next which will be a mix of Khurasan and Minifigs (a good match for height and build). Although I don't have any photos, my artillery are Minifigs and Altuos. For Stradiots, I used the same mix and old Minifigs for mounted cross bow but if I did them again, I would use Mirliton from their Condotiere range. madaxman.com has a useful and very comprehensive listing of manufacturers and many comparison photos. Midlander65 wrote: ... I replaced the lances. How do you get the lances with the thicker bit above the hand? The lances are quite easy. It sounds a long process but each step is quick and, if you do a few together, it doesn't take long at all. I use 0.8 mm brass wire. After shaping the point and cutting them to length, I mix up some Milliput and roll some into a long, thin (about 1mm dia) sausage. 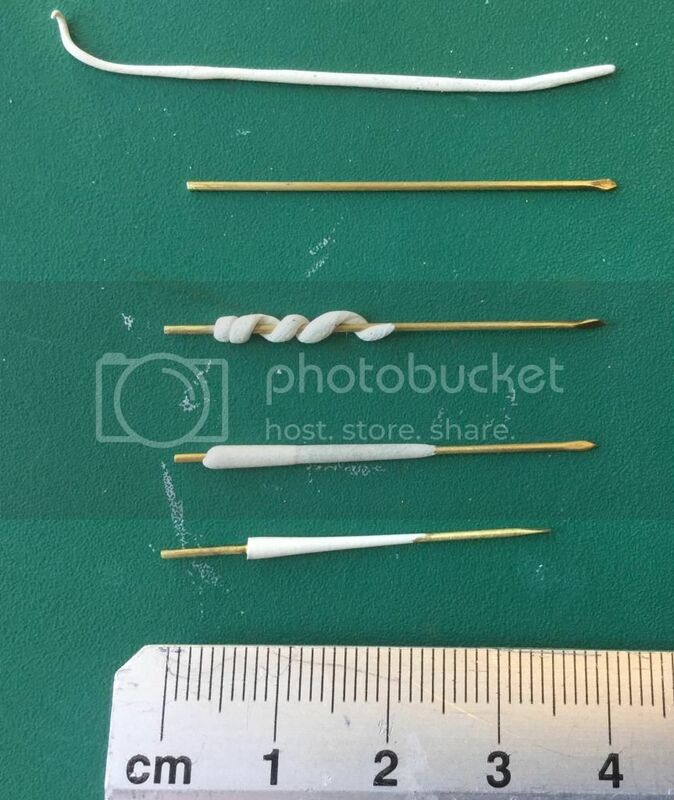 I cut a piece (about 30 mm long, IIRC) and wrap it around the lance in a spiral, starting with the spirals close together at the hand-end and widening the helix towards the point. I then roll the lance ona smooth cutting mat. Surprisingly this spreads the Milliput around the wire core very evenly, keeping the wire central. Then I set them aside to cure. Before the Milliput is absolutely hard, I cut the step for the hand with a sharp knife - doing it then avoids the risk if chipping or fracture. The final stage is to hold the hand-end of the lance in the pin vise again and use sand paper to shape and smooth the Milliput to achieve the slightly concave taper and the desired diameter. Midlander65 wrote: The lances are quite easy. It sounds a long process but each step is quick and, if you do a few together, it doesn't take long at all. Brilliant. I'm gonna have to give this a go. So, my next army is Danish... then something with loads of Gendarmes in it. Of course Gendarmes are next to useless, BUT they will look nice. I don't think I want to go Swiss, so maybe Spanish? Thanks for the lance advice. I will give it a go. I tried to get some made out of brass but the cost was prohibitive. titanu wrote: Thanks for the lance advice. I will give it a go. I tried to get some made out of brass but the cost was prohibitive. Just an aside, but I've done lances years ago with plastic sprue extruded over a candle. Trouble is that the plastic is fairly fragile and will break, which means you're not going to end up with bent lances, but you will end up with broken ones. Fairly easy to replace, but still I think the advise here is better. How do you paint such neat spirals on these lances? For sanding the lance to final shape, I hold the lance in a pin vise. Rough shaping is with a file to give a uniform cone then with folded-over sand paper wrapped around to give the flared profile (the nose of the vise helps with this) and smooth surface. The extra-long ones are for Essex figures, to compensate for needing an extra few mm below the hand. Although it makes the proportions wrong, I prefer to have the extra stability of having the lance glued to the figure at two points. The spiral painting was also done in a pin vise, free hand, painting a bit then rotating 45 degrees or so and painting a bit more. You can actually do multiple steps, equally spaced for each rotation. If you look close enough, the spirals aren't that neat: I use a three shade method so the boundary from one colour to the other is softened, averages out and looks smooth. It takes a bit of practice but the method is quite easy. One thing to look out for is that to keep the spiral thickness about the same, the helix needs to change as the diameter reduces. The sad thing is that I suspect the barber's pole lances were not used in battle but they look pretty. Midlander65 wrote: The sad thing is that I suspect the barber's pole lances were not used in battle but they look pretty. Of course they were used in battle... at least in my fantasy they were. I go back to my old standby, never let the facts get in the way of a good paintjob. That's the approach I have used. That and that's, despite what is shown in contemporary artwork, I just can't believe a French Gendarme would not choose the most showy, colourful option. PS. I just can't get the quote levels and attribution right on my iPad. Thank you. I'll have to try that. I really like your choice of colours. Especially on the gendarmes. What paints did you use for the nice green, white, blue, yellow and red? Derbo wrote: Thank you. I'll have to try that. I think you'll find that it's not the paint, but the technique you're seeing that will be making the difference. He has several layers of shading. A nice pot of paint will put down one nice colour, but you're seeing 2 or 3 shades of that colour. If you're not familiar, go to Youtube and look up layering and you'll get the idea. I know about layering, blending etc. But I like the tone of the colours and I'm always interested in new "colour recipes". Sometimes, even if you know the drill, it's easier to duplicate results if you know what paints were used. Getting new ideas for shading and highlighting different colours helps you getting better at painting. I have only recently returned to painting bright coloured figures so I am experimenting quite a lot with different recipes and techniques. The 'white' is a simple layering recipe which somebody has posted on Steve Dean's forum (a great resource which has helped me a lot, as has the Artmaster Studio website) for a warm white: all Vallejo, khaki grey, Iraqi sand, Ivory (occasionally a pure white top hi-light). Yellow is mostly based on a mix of Plaka Yellow Ochre and Vallejo flay yellow, adding more flat yellow and white for hilights and Vallejo red leather (sometimes dilute painted over, sometimes mixed in) for shade. Blue is Plaka blue deep as a base, Vallejo ultramarine as a midtone then white mixed in as a hi-light. Red is sometimes Vallejo scarlet with black mixed in for the shade, sometimes with Army Painter strong tone to reinforce the deepest shades. More recently, I have also been trying a triad of Vallejo red 033, dark vermillion 029 and scarlet 026. I often mix yellow ochre and white in for a top hi-light to try to get a slightly faded, toned down look. The green is based around Plaka green 44 with varying amounts of black or Army Painter strong tone for the shade and yellow and white mixed in for the hi-lights. This sometimes comes out really well but it is a bit unpredictable and the Plaka paint doesn't cover very well. Better suggestions gratefully received! Some very interesting combinations. Especially the white one from "khaki grey" upwards sounds very good. Will try that on some teutonic knights. I never tried plaka but will invest in some. "Orkhide Shade" was a very nice green from GW. You could highlight with white or yellow or use something like "deep green" from Vallejo. Sadly this is out of production. Maybe some extra opaque from Vallejo will come close. Will have to check that. I really like the white triad. To my mind it is just right for a pre-industrial white, avoiding the cold blue and grey bases more often seen. I used to use Plaka all the time but availability was always difficult and the range was quite small. Now I am only really using it because I have some pots left over. The only one I have not found a good replacement for is the yellow ochre - the Plaka is a nice warm shade but the Vallejo is too green/grey for my taste. Probably they have another colour that would be a perfect replacement and failing that, I'll have to look at Foundry or some other manufacturer. Hi Midlander, what a neat idea! I have been following your posts with interest and did try to PM you to discuss similar approaches and techniques. I also hate cast lances and pikes! Perhaps you could mail another Midlander?